When I was a child I had a step-father that made meal times an absolute nightmare. You had to take everything that was offered and eat every last bite whether you liked it or not. As a parent, teacher and adult, I realize tastes change as we grow. What we don’t like as I child, we may like as an adult and visa versa. I use this example today to compare how silence is introduced to us. When we are a child, silence is often used as punishment. We are sent to our rooms, given time outs, grounded etc. Currently we use rest and return. While there is value removing a child from a situation, the subtle message is punishment. Silence is a very valuable tool. If we choose to use it. We have a choice. We always have a choice. We are asked to be aware of how we teach it, use it and think about it. -Embrace silence. Silence is our friend. 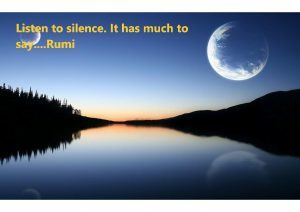 In the silence we learn. In the silence we recognize our power. -One of the drivers I hired to drive me home had his 3 year old riding in the “boot” of his tuk tuk. During the ride he kept reaching out to touch my shoulder. I would turn around and smile at him and then a few moments later he would lightly touch me again. It made me miss my little young-5s and kindergarteners. -While sitting on the beach in front of my little purple house, a woman from Canada approached me. She just arrived and was immediately going to go snorkeling. I offered to go with her. Just as we were arriving at the reef, I felt like I ran into a plastic bag. Then I was swimming in amongst several “pieces of plastic bags.” Then I felt stinging and I realized that these were not plastic pieces but jelly fish and I was being stung as was Anna. We immediately headed back in. -That seems like bad news. But we were not on shore more than 10 minutes and a storm quickly rolled in. We got in just in time.